Ailsa Rae has reached the age of 28 and never really lived. She was born with a cogenital heart defect, not expected to reach her teens. But now she has a new heart and has to learn live, and find out who she really is now her illness doesn’t define her. Ailsa is a lovely character. She is struggling to find out who she is, having been defined so many years as the girl with the broken heart. Her health, and later her need for a transplant, have governed her life, meaning that decisions haven’t really been there to be made, or at least, any decision making has been taking out of her hands. And so when this power is returned to her she struggles to know what to do, to see what would be the right path for her, conscious that she doesn’t waste this second chance. 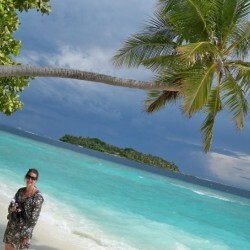 She therefore turns to her blog followers to decide things for her. Some of the votes have a dramatic and unforseen impact on her life. It is lovely to see Ailsa develop as the story develops, gaining the confidence to believe in herself, that it is ok to make mistakes and that at some stage she has to take the plunge and make decisions for herself. All of the other characters add something to the story, be it those who just appear on the page briefly or those like her mother, who have more of an impact on her life. The story moves between present day and the past, where we learn more about Ailsa and her relationship with Lennox, her first love, who unfortunately didn’t survive long enough for a transplant. I liked the writing style, it felt comforting and friendly and yet not too frivolous. I found myself whizzing through the pages and I would have finished it in a day had not the urge to sleep overwhelmed me. The book looks at many things in a fun, moving way. It exposes the need for donors and the life changing effect their selfless acts can have, from something as huge as a heart to something as small but vital as a cornea. It is a love story, with hints of Notting Hill to it. It is also a story about self realisation, about accepting ourselves but also realising we can change and grow, no matter what our age. 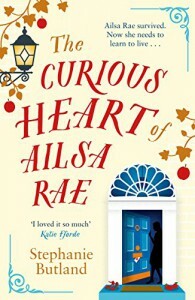 The warm writing and wonderful characterisation that ran through Lost for Words returns here in the lovely, moving, The Curious Heart of Ailsa Rae. I’m eagerly looking forward to Stephanie Butland’s next novel.